What account types are there? Unfortunately it is not possible to change your username after you have signed up, as it becomes your unique identifier throughout the site and on our back-end systems. You can cancel your subscription here at any time. How do you protect my payment data? Transactions are encrypted and secure and are handled by Paypal and Stripe, both well established and trusted payment processors. Paypal and Stripe process sales on our behalf at 'arms length' so your credit card details are never disclosed to Quickworksheets. We are a verified Paypal seller. I want to claim reimbursement from my employer. Can you provide a proof of purchase? Sure! After you have paid you'll be able to download a combined invoice and receipt (PDF format) from your Invoices page. I am a school. Can I pay via a Purchase Order? Yes! Simply place an order via our School Purchasing page and we'll send out an invoice. I cannot pay using a Credit / Debit card. Can I pay using an alternative method? For purchases by schools or organisations we can accept payment through a Purchase Order. The invoice can be settled by credit or debit card, ACH or Wire Transfer (for US-based customers), EFT "Pay Anyone" (for Australian-based customers) or check/cheque. If you are in Australia we also accept payment by direct credit to our Australian bank account. You can organise this through your Australian bank's online banking system. Please contact us to request payment by this method and to receive our bank details. We offer a 30 day money-back guarantee on annual prepaid accounts. If you upgrade but decide that Quickworksheets is not for you, please contact us within 30 days of initial purchase and request a refund. We do not offer refunds on group purchases. We also do not offer refunds on monthly subscriptions, but you can cancel your subscription at any time. If I choose a monthly subscription is there any minimum term? The minimum term is just 1 month! We don't lock you in to a long-term contract - you can cancel at any time. How do I switch from a monthly subscription to an annual prepaid account? Start by cancelling your subscription. You can continue to use your Premium Account until the end of your monthly billing cycle, after which your account will be downgraded to a Free Account. Once this happens you will have the option to upgrade to a prepaid account from your 'My Account' screen. All your worksheets and settings will be preserved during the downgrade/upgrade process. How do I switch from a Premium to a Pro Account? Please contact us and we'll sort it out for you. Please let us know whether you'd like an annual prepaid upgrade or monthly subscription. Do you offer packages of Quickworksheets Accounts at a discount for schools or organisations? Yes we do. Check out our discounted group pricing. Will you send me spam? Nope! Your e-mail address will only be used to send you notices and transactional messages that specifically relate to your Quickworksheets account. If you are interested in getting occasional news and special offers from us, you can choose to opt-in or out from our promotional mailing list by checking or unchecking the appropriate box when signing up. This promotional mailing list is entirely optional. You can opt-out at any time in future from your Edit my Details screen. How do I close my Quickworksheets account? Visit this page and confirm that you wish to permanently close your account. Make sure you've downloaded anything that you want to keep before you close your account - you won't be able to get it back later. Can I create worksheets with languages other than English? In general, yes you can. However, please note that some worksheet makers (such as our Spelling and Error Correction Worksheet Generators) will only work with English text, as the algorithms behind them are designed for English only. Please also note that the 'Hand' font does not support languages other than English. We value your feedback on how we can improve foreign language support. Please contact us to let us know of any problems you encounter. How do I change worksheet text size? You can set a custom font size by changing the primary size in the Formatting Bar at the top of each worksheet maker. Please note that some of our worksheet makers automatically scale the text size to fit the available space, so in these cases the we recommend that you leave the size set at "Auto". Can I use one word list to make multiple activities? 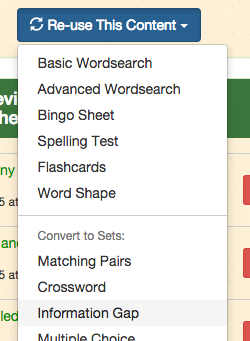 If you are creating a new wordlist-based worksheet (Word Scramble, Word Shape, Wordsearch, Bingo, Spelling Test etc.) click "Use a Word List..." to browse and search wordlists. Click on a word list to import it into your new worksheet. Both features allow you to enter a list of words just once and make a Word Scramble, Wordsearch, Spelling Worksheet and set of Flashcards, all supporting your target language. Click on a worksheet title to load it. Use the "Re-use This Content" menu in the sidebar to transfer the text to a different worksheet maker. Who owns the copyright in worksheets I make? Copyright in the worksheet content belongs to you. Copyright in the worksheet design belongs to Quickworksheets. Are there restrictions in how I can use the worksheets? There are sites around with thousands of pre-made worksheets available. What advantages does Quickworksheets offer over these sites? The Quickworksheets advantage is flexibility. You can customise your lesson materials with the exact target language or toward the exact lesson goal. This avoids the usual "60% fit" problem of using pre-made materials. With so many copyright-infringing pre-made worksheets floating around the internet, Quickworksheets also helps to keep you on the right side of the law. Finally, there is a certain satisfaction that comes from creating your own stuff. Try it and see! Why is Quickworksheets better than using a word processor for making worksheets? Have you ever tried making a wordsearch or word scamble with a word processor? It will take you ages! Quickworksheets is quick. It uses clever algorithms to automate the grunt work, and uses clean templates to eliminate time wasted on layout. Are my worksheets kept private? By default all worksheets you make are private. They will only be made public if you choose to 'share' them, which you can do on a worksheet-by-worksheet basis. Sharing your worksheets is entirely optional. What do I get in return for sharing worksheets with other Quickworksheets members? You get a guaranteed* warm fuzzy feeling from being such a great person! * Warm fuzzy feeling not legally guaranteed. Your personal warm and fuzzy experience may differ from that of others. Dotted writing lines do not appear on my print outs! There is a bug in Google Chrome's built-in PDF viewer on Windows that causes this behaviour. We have a page listing solutions to the Chrome on Windows PDF Printing Bug. What desktop browsers do you support? Quickworksheets is compatible with all modern versions of Chrome, Firefox, Safari and Edge. The only version of Internet Explorer that we support is Internet Explorer 11. If you log in with an unsupported browser it will be labelled 'unsupported' on your Devices page. Does Quickworksheets work on smartphones and tablets? Yes, our site has a responsive design that makes it easy to use on touch devices with smaller screens. Can I remain logged in at home and at work?